Picture taken of the Battlespace Preparation Autonomous Underwater Vehicle (BPAUV) by an employee of Bluefin Robotics Corporation during a US Navy exercise. The Blackghost AUV is designed to undertake an underwater assault course autonomously with no outside control. An autonomous underwater vehicle (AUV) is a robot that travels underwater without requiring input from an operator. AUVs constitute part of a larger group of undersea systems known as unmanned underwater vehicles, a classification that includes non-autonomous remotely operated underwater vehicles (ROVs) – controlled and powered from the surface by an operator/pilot via an umbilical or using remote control. In military applications an AUV is more often referred to as an unmanned undersea vehicle (UUV). Underwater gliders are a subclass of AUVs. The first AUV was developed at the Applied Physics Laboratory at the University of Washington as early as 1957 by Stan Murphy, Bob Francois and later on, Terry Ewart. The "Special Purpose Underwater Research Vehicle", or SPURV, was used to study diffusion, acoustic transmission, and submarine wakes. Other early AUVs were developed at the Massachusetts Institute of Technology in the 1970s. One of these is on display in the Hart Nautical Gallery in MIT. At the same time, AUVs were also developed in the Soviet Union (although this was not commonly known until much later). Until relatively recently, AUVs have been used for a limited number of tasks dictated by the technology available. With the development of more advanced processing capabilities and high yield power supplies, AUVs are now being used for more and more tasks with roles and missions constantly evolving. The oil and gas industry uses AUVs to make detailed maps of the seafloor before they start building subsea infrastructure; pipelines and sub sea completions can be installed in the most cost effective manner with minimum disruption to the environment. The AUV allows survey companies to conduct precise surveys of areas where traditional bathymetric surveys would be less effective or too costly. Also, post-lay pipe surveys are now possible, which includes pipeline inspection. The use of AUVs for pipeline inspection and inspection of underwater man-made structures is becoming more common. Scientists use AUVs to study lakes, the ocean, and the ocean floor. A variety of sensors can be affixed to AUVs to measure the concentration of various elements or compounds, the absorption or reflection of light, and the presence of microscopic life. Examples include conductivity-temperature-depth sensors (CTDs), fluorometers, and pH sensors. Additionally, AUVs can be configured as tow-vehicles to deliver customized sensor packages to specific locations. Many roboticists construct AUVs as a hobby. Several competitions exist which allow these homemade AUVs to compete against each other while accomplishing objectives. Like their commercial brethren, these AUVs can be fitted with cameras, lights, or sonar. As a consequence of limited resources and inexperience, hobbyist AUVs can rarely compete with commercial models on operational depth, durability, or sophistication. Finally, these hobby AUVs are usually not oceangoing, being operated most of the time in pools or lake beds. A simple AUV can be constructed from a microcontroller, PVC pressure housing, automatic door lock actuator, syringes, and a DPDT relay. Some participants in competitions create open-source designs. Submarines that travel autonomously to a destination by means of GPS navigation have been made by illegal drug traffickers. Autonomous underwater vehicles, for example AUV ABYSS, have been used to find wreckages of missing airplanes, e.g. Air France Flight 447, and the Bluefin-21 AUV was used in the search for Malaysia Airlines Flight 370. Hundreds of different AUVs have been designed over the past 50 or so years, but only a few companies sell vehicles in any significant numbers. There are around 10 companies that sell AUVs on the international market, including Kongsberg Maritime, Hydroid (now a wholly owned subsidiary of Kongsberg Maritime), Bluefin Robotics, Teledyne Gavia (previously known as Hafmynd), International Submarine Engineering (ISE) Ltd, Atlas Elektronik, and OceanScan. Vehicles range in size from man portable lightweight AUVs to large diameter vehicles of over 10 metres length. Large vehicles have advantages in terms of endurance and sensor payload capacity; smaller vehicles benefit significantly from lower logistics (for example: support vessel footprint; launch and recovery systems). Some manufacturers have benefited from domestic government sponsorship including Bluefin and Kongsberg. The market is effectively split into three areas: scientific (including universities and research agencies), commercial offshore (oil and gas, etc.) and military application (mine countermeasures, battle space preparation). The majority of these roles utilize a similar design and operate in a cruise (torpedo-type) mode. They collect data while following a preplanned route at speeds between 1 and 4 knots. 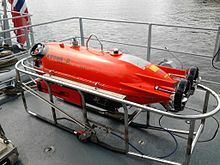 Commercially available AUVs include various designs, such as the small REMUS 100 AUV originally developed by Woods Hole Oceanographic Institution in the US and now produced commercially by Hydroid, Inc. (a wholly owned subsidiary of Kongsberg Maritime); the larger HUGIN 1000 and 3000 AUVs developed by Kongsberg Maritime and Norwegian Defence Research Establishment; the Bluefin Robotics 12-and-21-inch-diameter (300 and 530 mm) vehicles and the International Submarine Engineering Ltd. Most AUVs follow the traditional torpedo shape as this is seen as the best compromise between size, usable volume, hydrodynamic efficiency and ease of handling. There are some vehicles that make use of a modular design, enabling components to be changed easily by the operators. The market is evolving and designs are now following commercial requirements rather than being purely developmental. Upcoming designs include hover-capable AUVs for inspection and light-intervention (primarily for the offshore energy applications), and hybrid AUV/ROV designs that switch between roles as part of their mission profile. Again, the market will be driven by financial requirements and the aim to save money and expensive ship time. Today, while most AUVs are capable of unsupervised missions, most operators remain within range of acoustic telemetry systems in order to maintain a close watch on their investment. This is not always possible. For example, Canada has recently taken delivery of two AUVs (ISE Explorers) to survey the sea floor underneath the Arctic ice in support of their claim under Article 76 of the United Nations Convention of the Law of the Sea. Also, ultra-low-power, long-range variants such as underwater gliders are becoming capable of operating unattended for weeks or months in littoral and open ocean areas, periodically relaying data by satellite to shore, before returning to be picked up. As of 2008, a new class of AUVs are being developed, which mimic designs found in nature. Although most are currently in their experimental stages, these biomimetic (or bionic) vehicles are able to achieve higher degrees of efficiency in propulsion and maneuverability by copying successful designs in nature. Two such vehicles are Festo's AquaJelly (AUV) and the EvoLogics BOSS Manta Ray. AUVs carry sensors to navigate autonomously and map features of the ocean. Typical sensors include compasses, depth sensors, sidescan and other sonars, magnetometers, thermistors and conductivity probes. Some AUVs are outfitted with biological sensors including fluorometers (also known as chlorophyll sensors), turbidity sensors, and sensors to measure pH, and amounts of dissolved oxygen. A demonstration at Monterey Bay, in California, in September 2006, showed that a 21-inch (530 mm) diameter AUV can tow a 400 feet (120 m)-long hydrophone array while maintaining a 6-knot (11 km/h) cruising speed. Radio waves cannot penetrate water very far, so as soon as an AUV dives it loses its GPS signal. Therefore, a standard way for AUVs to navigate underwater is through dead reckoning. Navigation can however be improved by using an underwater acoustic positioning system. When operating within a net of sea floor deployed baseline transponders this is known as LBL navigation. When a surface reference such as a support ship is available, ultra-short baseline (USBL) or short-baseline (SBL) positioning is used to calculate where the sub-sea vehicle is relative to the known (GPS) position of the surface craft by means of acoustic range and bearing measurements. To improve estimation of its position, and reduce errors in dead reckoning (which grow over time), the AUV can also surface and take its own GPS fix. Between position fixes and for precise maneuvering, an Inertial Navigation System on board the AUV calculates through dead reckoning the AUV position, acceleration, and velocity. Estimates can be made using data from a Inertial Measurement Unit, and can be improved by adding a Doppler Velocity Log (DVL), which measures the rate of travel over the sea/lake floor. Typically, a pressure sensor measures the vertical position (vehicle depth), although depth and altitude can also be obtained from DVL measurements. These observations are filtered to determine a final navigation solution. There are a couple of propulsion techniques for AUVs. Some of them use a brushed or brush-less electric motor, gearbox, Lip seal, and a propeller which may be surrounded by a nozzle or not. All of these parts embedded in the AUV construction are involved in propulsion. Other vehicles use a thruster unit to maintain the modularity. Depending on the need, the thruster may be equipped with a nozzle for propeller collision protection or to reduce noise submission, or it may be equipped with a direct drive thruster to keep the efficiency at the highest level and the noises at the lowest level. Advanced AUV thrusters have a redundant shaft sealing system to guarantee a proper seal of the robot even if one of the seals fails during the mission. Underwater gliders do not directly propel themselves. By changing their buoyancy and trim, they repeatedly sink and ascend; airfoil "wings" convert this up-and-down motion to forward motion. The change of buoyancy is typically done through the use of a pump that can take in or push out water. The vehicle's pitch can be controlled by changing the center of mass of the vehicle. For Slocum gliders this is done internally by moving the batteries, which are mounted on a screw. Because of their low speed and low-power electronics, the energy required to cycle trim states is far less than for regular AUVs, and gliders can have endurances of months and transoceanic ranges. Most AUVs in use today are powered by rechargeable batteries (lithium ion, lithium polymer, nickel metal hydride etc. ), and are implemented with some form of Battery Management System. Some vehicles use primary batteries which provide perhaps twice the endurance—at a substantial extra cost per mission. A few of the larger vehicles are powered by aluminum based semi-fuel cells, but these require substantial maintenance, require expensive refills and produce waste product that must be handled safely. An emerging trend is to combine different battery and power systems with supercapacitors. ^ "RoboSub". Archived from the original on 13 June 2015. Retrieved 25 May 2015. ^ "Robotic Submarine Running Debian Wins International Competition - Debian-News.net - Your one stop for news about Debian". Archived from the original on 28 April 2015. Retrieved 25 May 2015. ^ Lichtenwald, Terrance G.,Steinhour, Mara H., and Perri, Frank S. (2012). "A maritime threat assessment of sea based criminal organizations and terrorist operations," Homeland Security Affairs Volume 8, Article 13. ^ "Malaysia Airlines: World's only three Abyss submarines readied for plane search". Telegraph.co.uk. 23 March 2014. ^ "Bluefin robot joins search for missing Malaysian plane - The Boston Globe". BostonGlobe.com. Retrieved 2017-02-28. ^ Department of the Navy, The Navy Unmanned Undersea Vehicle (UUV) Master Plan, 9 Nov 2004. ^ "AUV System Timeline". Retrieved 25 May 2015. ^ "LAUV – Light Autonomous Underwater Vehicle". www.oceanscan-mst.com. Retrieved 2017-02-28. Wikimedia Commons has media related to Autonomous underwater vehicles. This page was last edited on 24 February 2019, at 23:46 (UTC).